... After his loss to Voinovich, Celebrezze joined the law firm of Kegler, Brown, Hill & Ritter, and recently was a consultant for Diebold Inc., promoting electronic voting machines. "Death of a Patriot: No More 'Blind Faith Voting,'"
Andy had worked for Black Box Voting and barnstormed around the country investigating and speaking. It was Andy who uncovered (among other things) much of the story of Jeffrey Dean, the VP at Diebold who did software programming, who was a convicted felon whose crime had been embezzlement using computers. Andy went to many of the nation's election hotspots, including Florida and Ohio. He had said a year earlier: "I've been threatened by these people [makers of voting machines]. I've been followed from my home to work. The president of Diebold told me to back off or I would get a visit. My phone's been tapped. I've been ridiculed. I've been called a conspiracy theorist. You bet I'm going to demonize them. It's wrong. We're privatizing our elections. It's something that should remain in the hands of the people...We need to take it back. It's We the People." "If they take our right to vote away, we're nothing but slaves. I'm sorry. I'm not willing to be a slave. 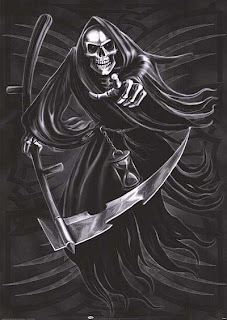 I'm not willing to go quietly into the night." --Andy Stephenson, July 13, 2004 in an interview following a press conference next to the Austin State Capitol Rotunda. Columbus, Ohio resident Bill Moss was highly visible in the efforts to rectify the many wrongs of the November 2004 election in Ohio. Elected five times to the Columbus Board of Education, Rev. Moss was an eloquent speaker. He was considered a possible national spokesperson for the election reform movement, in an informal meeting held in Houston on June 30, 2005 after the Election Assessment Hearing. Like Athan Gibbs, Moss was African-American. "Pilot killed as plane crashes in Lake Twp." Connell was "a key witness in the King-Lincoln v. Blackwell lawsuit regarding fraud in the 2004 election in Ohio. That ongoing lawsuit led to Connell's deposition on November 3, 2008, the day before the general election. 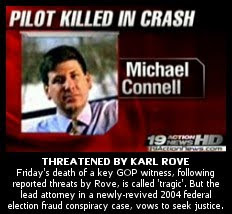 According to plaintiff's lead attorney Cliff Arnebeck, Connell was also threatened by Karl Rove in attempt to intimidate him into 'taking the fall' for Ohio election fraud." --"BREAKING: Mike Connell, GOP 'IT Guru' Reportedly Killed in Solo Plane Crash!" 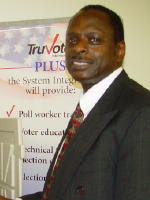 Pokey Anderson has broadcast or published numerous reports on voting machine issues over the past four years. She co-produces a weekly news and analysis radio program, The Monitor on KPFT-Pacifica in Houston.